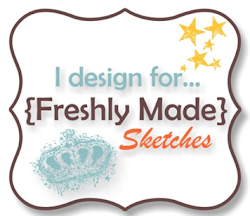 Here’s this weeks sketch from Lesley’s Merry Monday Challenge. I’ve gone with Christmas Lodge this week. I really like this set but it hasn’t made it to the Australian catalogue as yet (so I had to buy it off ebay!). I added some trees from Lovely as a Tree around the lodge to make it appear as if it was in the woods. I then stamped it a second time and cut around it and raised it up to add a little dimension. You’ve been a busy girl Narelle! 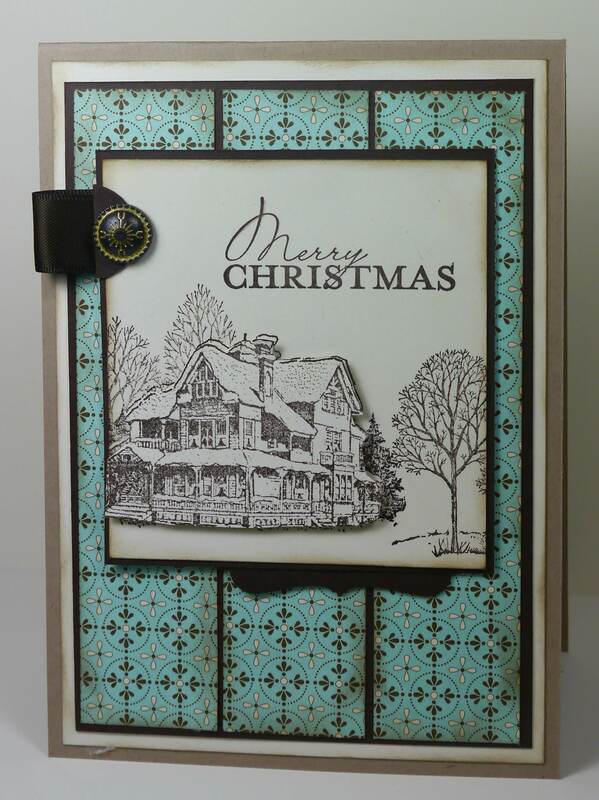 This is another gorgeous card, I just love the blue/brown combination of this one. I love that you have used shading only to enhance the image and let the gorgeous DSP provide the colour. This gives such a peaceful feeling!! Such a lovely Christmas card. So elegant Narelle, I wish I had gotten that set, Love the simple stamping, it allows the images to shine. Beautiful … Inspired me to dig out my cottage stamp and remember to use it as a winter scene sometime soon! Love the powers too. This is lovely….CAS but still very pretty. I love how you added the additional trees around the edge…perfect! 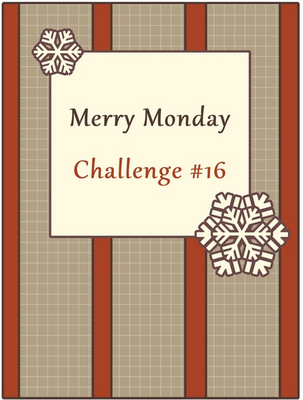 Thanks for participating in the Merry Monday challenge with us this week! Super gorgeous Narelle! Love all the details! Thanks so much for playing along with Merry Monday! Your xmas card is wonderful! I love the color on the design paper, and it’s just perfect with this wintery image in greys. Love it!